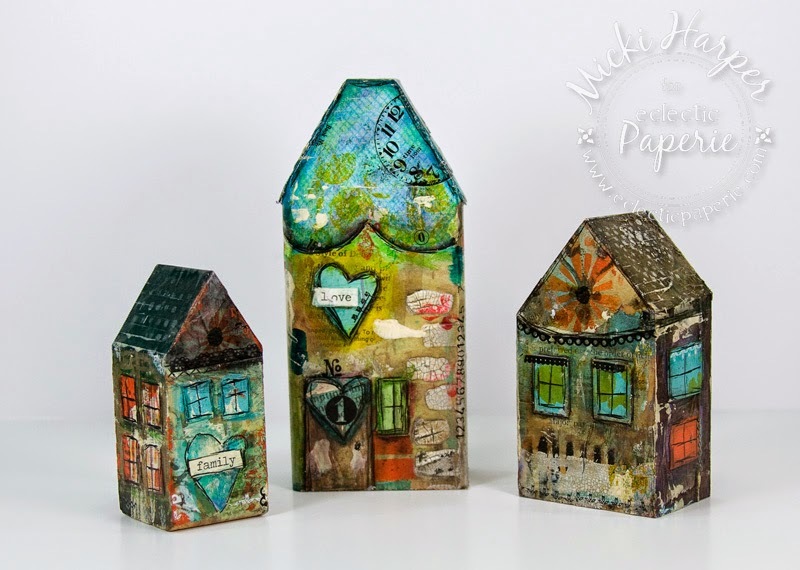 Hello eP Nation, Micki here for my final post for eclectic Paperie! I waited until the last minute to draft up this post. I’ve never been good at writing, much less writing about my feelings. And then there is that daunting task to highlight some of my favorite eP projects. How can I choose, when each and every project taught me something new, made me step out of my comfort zone and stretch my artistic capabilities? But I think I’ve narrowed it down to half a dozen (insert cheesy grin). Although I love to throw everything but the kitchen sink into my art making, when it comes to creating cards , I truly tend to create in a clean and simple style. 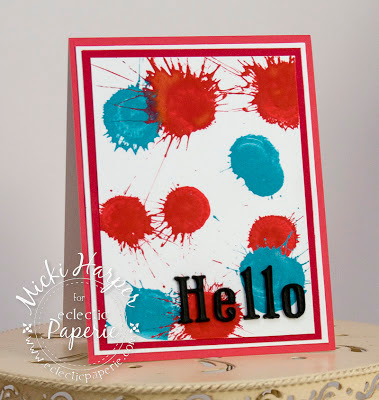 I tend to use white card base and colored card stock for a pop of color. Using designer paper and colored card stock as a base is hard for me. And then to try and add a lot of embellishments such flowers, buttons, ribbons and lace – ha, now we’re talking a project time frame of, ummm, several hours. 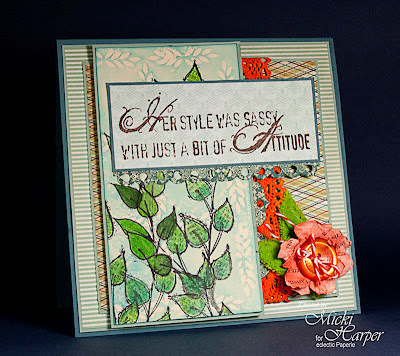 I truly surprised myself when I created my Sassy Attitude card. Not only did I use a non-white card base, I incorporated stencil, distress paint, lots of layers, punched edge panels AND a bit of embellishments. This is the project I really fell in love with my Faber-Castell Gelatos. This little canvas took no time at all to create. Made out of recycled cardboard. This was totally inspired by Sherry. Although no where near as gorgeous as Sherry’s creations, I was proud of my flowers and the ruffled ribbon edging all mixed in with a bit of mixed media. What’s not to love about the splats! 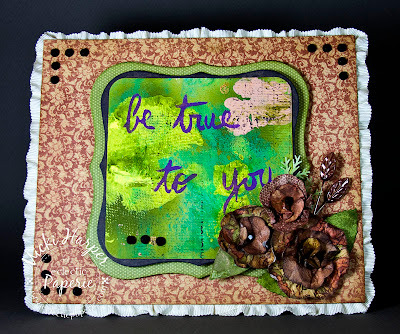 This card came about by just playing with the (then new) Distress Paints. I absolutely loved it so much that I created several more!! All I can say about this project is that I once again amazed myself. And in fast forward, I look like I knew exactly what I was doing. And finally, another one of those projects that had me second guessing why I decided to start on this project but finishing it anyway. These are just a few of my favorite projects. Each project created for eP made me stretch outside of my comfort zone and on quite a few occasions would end up totally different then what it had started out. Oh and then there were those “hiccups” or “creative opportunities”…..but I can truthfully say that I've found inspiration from every team member and these inspirations can be found in all of my projects. Words can not express how thankful and grateful I am to eclectic Paperie. To Daisy for asking me to be on the design team when the original E-Team was created. To Kim for asking me to continue on the team. To the design team and to YOU, eP fans! I could go on and on and still not convey my feelings. To each of you……..For believing in me and cheering me on. For unconditional support…… Thank You, Thank You, Thank You. 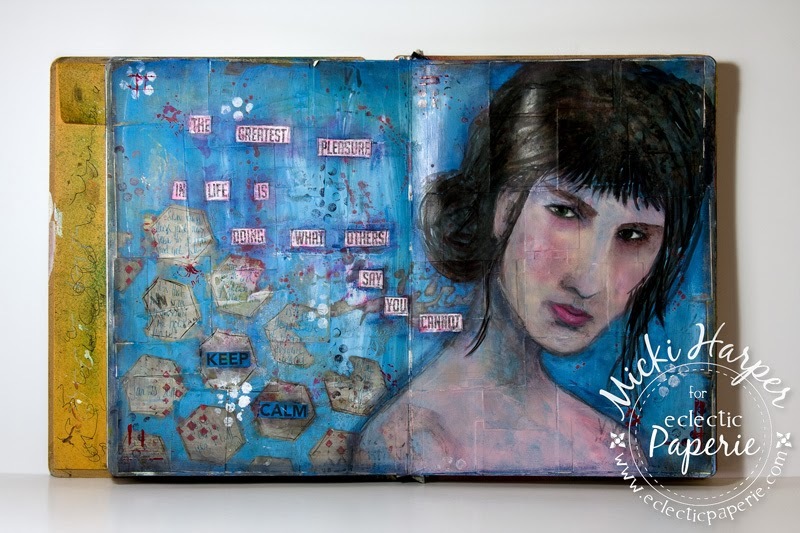 A wonderful review of many of your beautiful creations Micki! 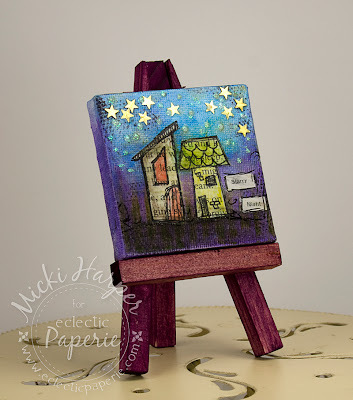 I especially love the mini canvas and your glorious houses! It's been a pleasure working with you on this team - and I appreciate all of your inspiration! I too agree that YOU have been a Pleasure to be on the eP team with! Your comments are Always Fabulous and looking back at Your memories was just Delightful! Although I LOVE them all, I will forever think of you and your FABLOUS houses! THX for the memories! And if you're ever in Florida.....! I found you through eclectic Paperie. You are a talented and special lady! I can see why you chose these projects, Micki! They are all favorites of mine as well. Can you believe we won't be on the eP team any longer? It's been forever, and so great. Thank goodness we still have FB!